Developed for the best cleaning results – thanks to a water pressure of 230 bar – and protected by a very robust basic frame, the machine impresses even under extreme conditions. The ergonomic frame concept offers maximum mobility, even on uneven surfaces. 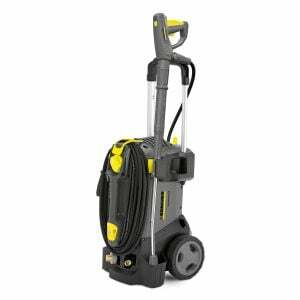 Puncture-proof wheels, the successful operating concept and a range of storage possibilities for accessories make the machine very convenient to use. Other convenient features include the EASY!Force high-pressure gun, which makes use of the recoil force of the high-pressure jet to reduce the holding force for the operator to zero, and the EASY!Lock quick-release fasteners, which make set-up and dismantling five times faster than with conventional screw connections. The powerful pump enables the removal of water from lakes or ponds in an emergency. It is protected by a large water filter and a thermostat valve which prevents it from overheating in recirculation mode. Also available for the HD 9/23 G is a cage frame with eyelets to facilitate crane loading, as well as an attachment kit for a hose reel. 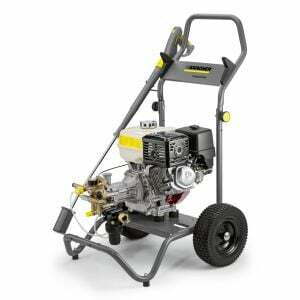 Write Your Own Review:Karcher High pressure washer Honda Engine 13HP Cold Water Cleaner HD 9/23 G EASY!